The bank I referred to yesterday is Wells Fargo. I’m in the process of closing out all my accounts there. It’s really just to simplify my finances, but I could have justified it with the never-ending stream of scandals coming out of this bank. Says Huffington Post: ‘To any reasonable person, Wells Fargo is a rolling disaster – a ripoff, wrapped in a swindle, inside a bank’. And: ‘Wells Fargo’s very existence, not to mention its continued profitability, is an indictment of two decades of embarrassing regulatory oversight from four separate administrations‘. Among the scandals: millions of new accounts in customers’ names without their consent, wrongly repossessing 27,000 cars, and foreclosing the homes of 400 families for no reason. 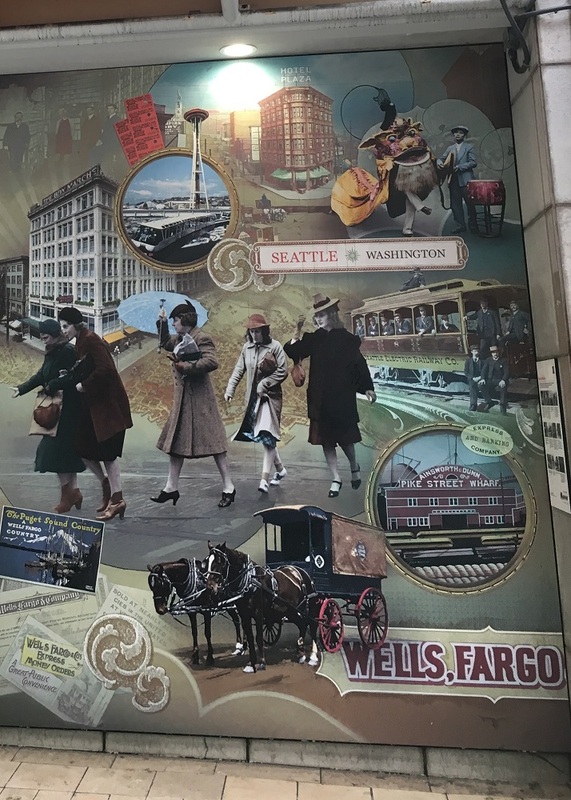 Nice picture collage of Seattle’s history outside the Wells Fargo branch at Westlake Center, though.